In this post I will explain how to connect your website visitors with their Facebook accounts , so you don't need to prompt your users with registration forms or login forms , just a button to login with Facebook or connect with Facebook and you are done . You can save your users Facebook data in your database , also you can save their Facebook login status in cookies not to prompt them every time with the login dialog . I will also explain how to post on Facebook users timeline , also post on the pages they own ( or the pages in which they are admin ) . Also the post can include photos or videos like any post you put on facebook. First you have to create a new app , go to http://developers.facebook.com/apps and then click on "Create New App" button , choose a unique name and then click Create . You can choose free webhosting if you don't have a host . You will be redirected to a page where you can edit your app settings , to visit this page again , you can go to http://developers.facebook.com/apps you will find your apps on the left , and Edit Settings link on the right . The first page is Basic page , you can edit general information about your app , the most important thing you have to check is "App Domains" , you can enter several domains , but you must have control on them. Also in the Basic page you have you app ID and app Secret , grab them and save them for now . The second page is Basic > Permissions , you have 2 fields to edit ( User & Friend Permissions ) and ( Extended Permissions ) , you will find a list of available permissions here ( http://developers.facebook.com/docs/reference/login/#permissions ) . If you need access to the users friends list , you have to add read_friendlists to extended permissions . If you want to post on their behalf , you should add publish_stream . And if you need to manage their pages , you have to add manage_pages to extended permissions. Go now and download from github the facebook php sdk ( https://github.com/facebook/facebook-php-sdk ) , copy the src folder to somewhere included in your website . Go to your index.php page , or any page you need to be accessed by facebook and type the following. 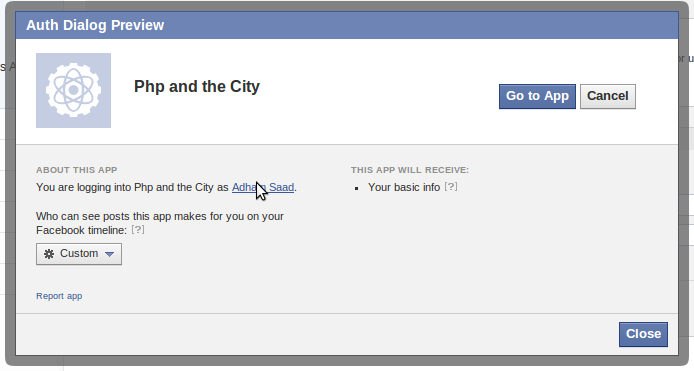 APP_ID and APP_SECRET can be got from the basic page of your facebook app ( http://developers.facebook.com/apps ) . Second you need to check if the user is logged in and has authorised your application or not , this can be done using the following line . If the user is not logged in , we should print a login url to connect the user with facebook . You should add the scope ( or the permissions ) you have included from the settings page in your app , in the login url that the user will go and click and authorise your app , so he ( the user ) will authorise your app for the permissions included . The user should be prompted with something like that . If the user authorised your app , he should be redirected back to your website so you can check again if he logged in or not. // we can grab the user account data . $params is associative array of the post parameters , you can get full description of the parameters here ( https://developers.facebook.com/docs/reference/api/post/ ) . I hope that will be useful for anyone want to use the facebook php sdk .